The Sector features a shell constructed of windproof/water resistant polyurethane-coated heavyweight Toughlan® nylon and is lined with heavyweight 10 oz. anti-pilling Panda Fleece™. 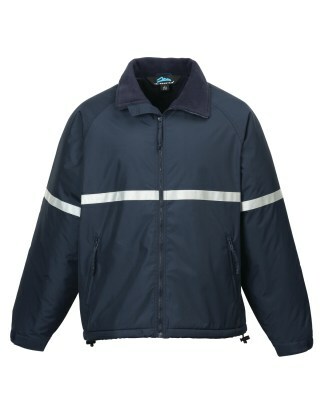 Features 1" wide reflective tape across front, back and sleeves. Accented with two front pockets with zippers and an inner right chest zippered pocket. embaccess system for clean embroidery. Adjustable cuffs and an open bottom with draw-cord hem for a custom fit. Raglan sleeves.